June is traditionally wedding season (hi, I’m married to a professional videographer, so I know these things), and that puts me in the mood to look at wedding dresses. Since Downton Abbey finished up this spring, why not revisit the surprisingly large number of wedding ensembles featured in the six seasons of the show? Here’s my ranking from least interesting to most fabulous! Feel free to share how you’d rearrange the Downton Abbey wedding outfits in the comments. Who dropped a fugly bomb on her? Sure, it was a civil ceremony, but that didn’t mean she had to dress like an old lady. Gag. Y’know, she wore fancier suits earlier in the series and better trimmed dresses as a Mary’s maid. 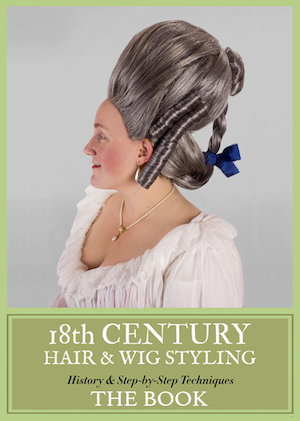 For her own wedding, Anna gets the most ho-hum daytime apparel she could scrounge up. This was an awfully sweet look — in fact, it’s the first time we really see Daisy dressed up. In later seasons, she gets some sharp 1920s dresses, and this simple floral blouse and skirt worn with a curled hairstyle is a hint of how nice she can look. Distinctly average. Yes, it’s a second wedding, but she’s not ancient. The cut does nothing for her, and the whole thing makes her look like somebody else’s mother of the bride. After a bit of comedic relief, Elsie got something posh yet suited to her tastes to wear on her wedding day. The velvet coat from Lady Grantham was just right. If you have to get jilted at the altar, at least do it in a beautiful gown with a long tulle veil (though maybe wearing the same tiara as your spiteful sister was a bad move?). All cool, silky elegance, this classy number combines the essence of Mary’s style with a touch of romance and is ideal for her union with Matthew. Yep, Lady Rose makes both the bottom AND the top of my list! For as frump-tastic as her official wedding suit is, her reception gown is stunningly gorgeous and befitting the pretty little lady she is. Bonus points for being an unworn vintage 1920s find that the series costume designer restyled for Lily James to wear in the show. 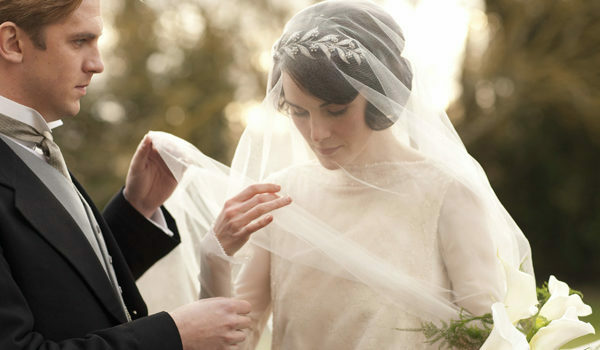 OK, what’s your fave (and least fave) Downton Abbey wedding gown? I love your number 1 pick, by far the prettiest of the lot! I know I’m in the minority but I HATED Mary’s first wedding dress, I found it incredibly matronly and boring. 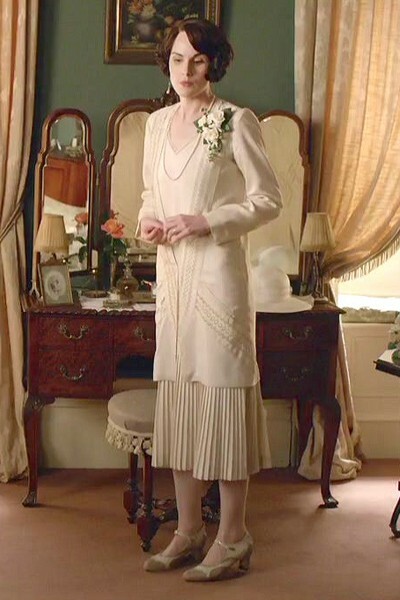 I wouldn’t say I “hated” Mary’s first wedding dress, but I certainly liked Edith’s first one better. Mary’s just seemed blah after all the buildup to her wedding to Matthew. And Edith’s was just beautiful in person when I saw it on exhibit. I also hated Mary’s first dress. It was somehow frumpy and dowdy, and reminds me of a toga party. I always thought Edith’s first dress was way better than Mary’s. Mary’s was totally on point for the era, but Edith’s showed her figure so much better. I love Rose’s Reception Gown! So gorgeous! Edith’s “real” wedding dress reminded me a bit of Kate’s dress when she married Prince William. Your ranking is similar to mine, except I would put Rose’s registry office highest above Anna’s, Mrs Hughes’ and Daisy’s, but below Mary’s second. My top three are definitely 1) Rose’s Reception Callot Soeurs similar dress; 2) Edith’s wedding to Bertie Hexham dress and 3) Mary’s wedding to Matthew dress. Finally, Edith is higher ranked than Mary. The Reception Gown is fabulous. Everything else was snoozeville. 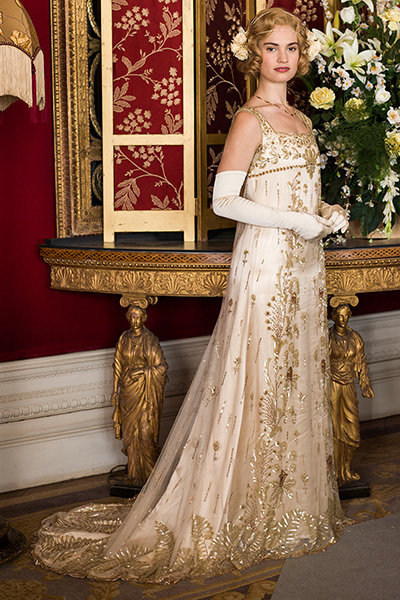 The problem with Lady Rose’s gown is that it’s not 1920s – it’s a c.1910 Edwardian gown, and it looks it. A stunning dress, but not very 1920s at all…it came from the fantastic Pennies Vintage, one of London’s best vintage dealers. Well, the 1920s were a pretty regrettable time in wedding dress history (battling it out with the 1980s), the Downton costume designers did the best they could without going completely ahistorical. I hated Edith’s second wedding dress. I don’t know if it’s the neckline, or the length of the sleeves, but there’s something about it that’s just really off for me. Didn’t’ like Edith’s real wedding dress at all. I agree with Jillian. I think the neckline and sleeves are off, the veil is too short and the bouquet is overwhelming. It’s weird that with so many amazing costumes they did over the years, the DA costume designers laid quite a few wedding dress eggs.